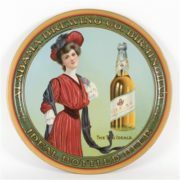 This is a beautiful Tin over Cardboard (TOC) advertising sign for the Falstaff Brand manufactured by Wm. 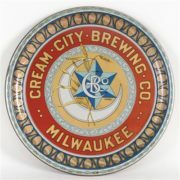 J Lemp Brewing Co, circa 1935. 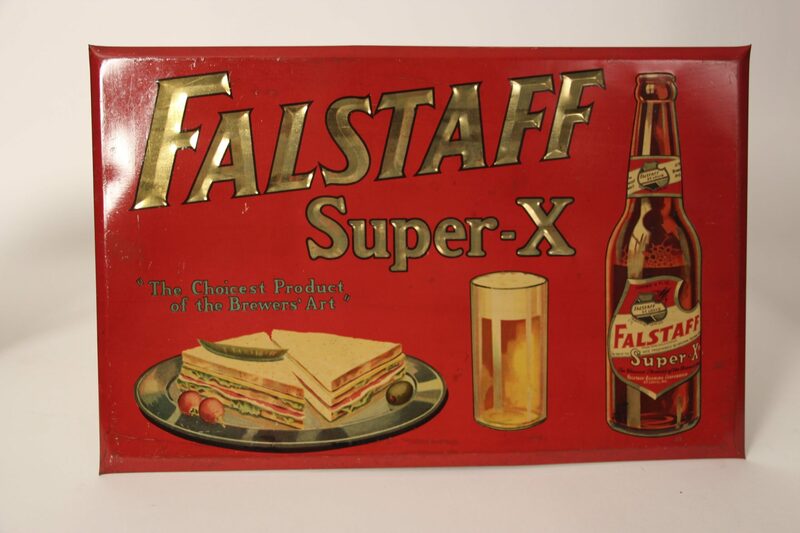 It has a red background and reads “Falstaff Super X – The Choicest Product of the Brewers’ Art”. The main image features a bottle of the Falstaff Super X beer, a mug of beer and a sandwich. There is a “sister” sign to this one without the Super X label on it. 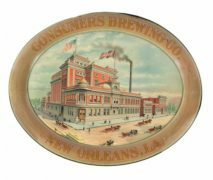 At the time, the Falstaff Brewery was in three locations: St Louis, MO, Omaha NE, and New Orleans, LA. 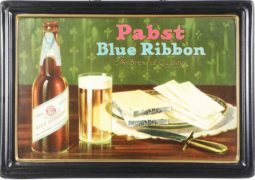 Tin over Cardboard signs like this Falstaff one were used both before Prohibition and heavily again afterwards until the late 1950s. 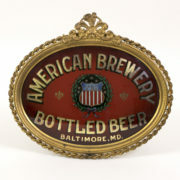 A celluloid cover was sometimes placed over the tin advertising as a way to protect the design on the sign. TOC signs were eventually replaced with signs made strictly from cardboard because they were cheaper to make, easy to put up, and could be thrown out when the sign was worn due to weather or the advertising changed. 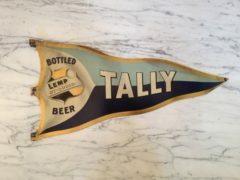 The Falstaff brand was originated by the Adam Lemp Brewing Company. 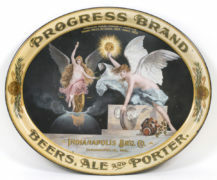 The Lemp brewery was ahead of its time already in the late-1800’s when the business started to use refrigerated train cars and their own railroad line to ship products nationwide already starting in the 1880s. 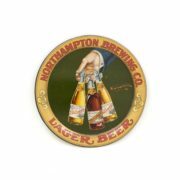 Eventually William J. Lemp took over the brewery from his father John Adam Lemp, and both helped grow the company to be very successful. 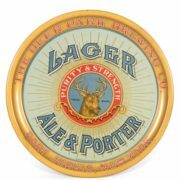 By 1900 the Lemp Brewery was one of the top 20 largest breweries in America and their Falstaff beer was more popular than ever. 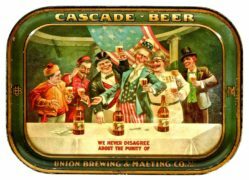 The Lemp Brewing Company produced some amazing Falstaff antique advertising pieces and today they remain some of the most sought after Breweriana collectibles in the United States.